Listed below are some of the more frequently requested services. If you have something in mind that doesn’t fit these categories just give me a call at 508-277-2601 or send email directly to: andy@hellerphoto.com Thank You! Business Headshot- $165.00 includes studio time and two retouched image files. I’ll travel to your location for 5 or more employees. Discounts available for multiple employees. Corporate Events- Please contact me with details of your event so I may provide you with an accurate quote. I provide coverage for everything from a two hour award ceremony to multi-day conventions. Family Portrait (in-studio) $175.00 includes studio time and set of emailed proofs. Portrait prints may be ordered on an individual basis without being locked into any large “packages” In-home session also available for additional fee. Pet Portrait Special- $95.00 Bring your favorite furry friend for a studio portrait. The pet special includes shoot time, emailed proofs and an 8×10 print of your favorite image. 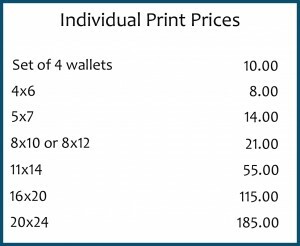 Additional prints may be ordered from the print price list. Special Events I photograph a limited number of weddings and Bar Mitzvahs each year. In recent years demand for traditional albums has dwindled. With many clients preferring to own the digital images and opting to make their own albums, event coverage now consists of shoot and editing time, with a disk of edited/adjusted images being provided to you. You will have full ownership rights to the images and may reproduce them without restriction. Five hours of event coverage with edited disk is $1950.00. Additional hours of coverage may be purchased for $175.00/hour. I still offer beautiful professional albums but these are an a la carte “add-on” and will not be included in a package.